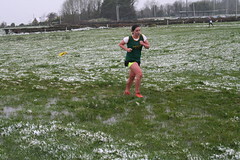 The Irish Life Masters T&F championships took place on Saturday last in Tullamore, Co. Offaly. We had 6 athletes representing the club at this national competition. Many of the athletes achieved personal best times and these performances, in turn, won a set of relay gold and 4 individual bronze medals. First off was the W35 100m where there were 2 heats and final positions were determined by times. Kate Harrison finished 7th in 14.27 and Ber Spillane 11th in 14.80 in this category. Liz Power was also in action in the W55 100m where she sprinted home with a Pb of 17.75 earning her a bronze medal while her husband Ray finished 4th in the M55 100m in 16.14. The same 4 athletes lined out for the 200m in their respective categories. Again, there were 2 heats in the W35, which was also decided on times. Kate powered for the finish line with a Pb of 29.33 in 3rd position. Ber finished 9th, also with a Pb of 31.16. Liz had another wonderful result where she finished 3rd in 38.01 at W55 level and Ray was 6th in the M55 in 33.35. Next out was Brigid Gleeson in the W45 800m. She ran a strong and steady race to take 4th position in a Pb time of 2.43.97. This was another 4 seconds off her previous best time. The 400m was the final individual race for the athletes. First up were Ber and Edel Delaney where both got Pb’s. Ber finished 4th in 1.10.77 and Edel 5th in 1.13.69. Liz added yet another bronze medal to her collection in a Pb time of 1.30.00 in the W55 category and Ray finished 9th in the M55 in 1.14.18. With spirits on a high, Kate, Ber, Edel and Brigid lined out for the 4 x 400m relay where they did themselves proud – finishing in 1st place in 4.49.78. Huge congratulations to all the athletes involved. The hard work, dedication and sacrifices have reaped dividends for them all. Also a massive thank you must go to Martin Flynn for his time and dedication given over the last year where the track and field journey began for these athletes. Tipperary Ladies and Men qualified for the finals of the National Track & Field League in Tullamore this weekend with Katie Bergin and Ellie Houlihan members of the ladies team. Well done to both athletes on their performances particularly as they are so young and up against seasoned competitors. Katie competed in the 100mts and the 4 x 100mts relay while Ellie competed in the 3,000mts. Congratulations to all the athletes from Tipperary on their performances which saw the Men finish fourth and the Ladies eight. Saoirse Doran and Billy Gleeson represented their respective parishes in the National Community Games in UL at the weekend. Saoirse finished 8th in her race – the Girls U/12 600mts – just missing out on qualifying for the final on Sunday. Billy Gleeson finished 2nd in his race, the Boys U/10 200mts thus qualifying for the final and though not amongst the medallists did exceptionally well over the weekend. Well done to both athletes. There were no winners in the lotto this week. Thank you for your continued support. Training continues on Tuesdays and Thursdays at 7:30pm for athletes aged 8 and over who wish to run in the upcoming cross country season. The first fixture will be held on the first Sunday in October.